If you have ever spent time in a greenhouse saying "I wish this greenhouse had...", you'll discover this is the greenhouse that finally listened. The Brighton is a perfect mixture of thick 4mm panels letting the perfect amount of light into your greenhouse while offering great insulation. The opaque panels also difuses light , keeping direct sunlight from burning or damaging your plants. Add to that a heavy-duty frame and you have the perfect growing environment for a starter greenhouse kit. The Brighton has a powder-coated steel base kit with an aluminum frame which is available in dark green. 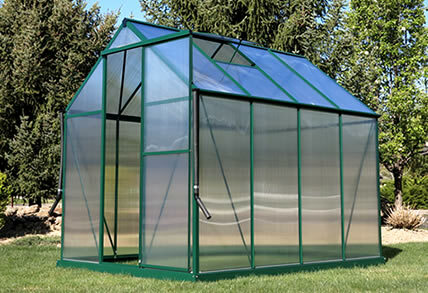 The greenhouse itself comes in sizes from 6x4 to 6x8, covering the needs of the start-up gardener or avid greenhouse professional with limited space. The units are constructed with a roof vent and rain gutter kit allowing you to easily utilize outside elements in your greenhouse. Construction is easy and takes about 4-6 hours with two people. Brighton has an online video easily taking you through the stages of assembly. No obscure tools needed, everything require is found in a common toolbox. Brighton comes with a 5 year limited warranty but due to the strong poly-panels you most likely won't need it. Based on the functionality of the Brighton greenhouse kits, the aesthetic and efficiency of the polycarbonate panels, and the ease of assembly we give this greenhouse our 2nd highest rating and feel confident you'll be very happy with a Brighton purchase.